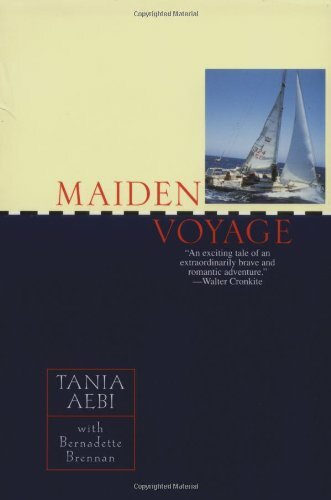 About once a year, I re-read the book Maiden Voyage by Tania Aebi. I originally read it when it first came out, and I remember being curled up on the bed in my dorm room on a cold, grey, San Francisco morning, drinking hot tea and living vicariously on Aebi’s solo voyage around the world. At the time she made the voyage, she was just a couple of years older than I was. At the time I read it, I was the same age she was in the book. It’s a cold, grey Texas Sunday, and even though I have a thousand things I should be doing, I can’t help but want to escape into this book. It’s technically a memoir, but it’s such a great story that it reads like a novel, and whenever I return to its pages, I’m also sailing along with Tania on her sailboat the Varuna with her cat Dinghy (and later Tarzoon), as she discovers life and love and learns about celestial navigation and engine maintenance. I’ve made this journey many, many times with Tania over the last twenty or so years, and every time, I find something new in her story, or it evokes something new in my head. And of course, with each reading, my fantasy of living aboard a sailboat for several months is rekindled. Except, of course, that I don’t really want to live that basically. I mean, I am the woman who hates camping, and thinks “roughing it” is a hotel that doesn’t have room service or free wifi. Even so, it’s nice to relive Tania’s Maiden Voyage from time to time. Just as it’s nice to relive any favorite dream, and enjoy the wishing as much, or more, as you would the fact of what you’re wishing for. Sunday Salon: Maiden Voyage by Melissa Bartell is licensed under a Creative Commons Attribution-NonCommercial-ShareAlike 4.0 International License. I almost never reread books, but I love it on the rare times that I do. Thank you for sharing this book with us. I’m off to add it to my Amazon list. I’d like to invite you to sign up for my February Giveaway! Win All Kinds of Kisses or a $25 Amazon gift card! I haven’t heard of this book before, but it sounds good. There is a new memoir coming out called “Wild” that sounds somewhat similar (just a little) and that I’m really looking forward to. I hadn’t heard of this book before either, but I’m adding it to my mental list of books to keep an eye out for. Thanks! I love the comfortable feeling of escaping into a re-read. It’s like slipping on a well worn and comfy t-shirt, there’s something comforting and familiar. I haven’t done much re-reading in many many years but I used to when I was younger. I’m thinking perhaps I should make more of a habit of it. Next problem: which book to choose?